The Wheels on the (Library) Bus Go Round and Round! Our NEW van returned to service today delivering FREE resources to area child care providers in Bessemer and McCalla. Visits will be made to child care providers in Blount, Shelby and Walker counties later this month. Childcare Resources’ team members and Family Studies student interns from Samford University’s Olean Bullard Beeson School of Education and Professional Studies celebrate the new Mobile Library and are ready to load it up with books and other resources to donate to area child care providers. Many thanks to all of our funders! Books and puppets make learning fun! Lots of books for child care providers! Catrice takes the new van out on its inaugural run! Our new mobile library van! Due to a generous grant from Community Foundation of Greater Birmingham and additional support from Crown Automobile along with support for materials from PNC Grow Up Great and United Way of Central Alabama, Childcare Resources announces the return of the agency’s Mobile Library service. This free service is available to area child care providers in Blount, Shelby and Walker counties and rural areas of Jefferson County. The Mobile Library delivers much needed books, music, play items, puppets, and teacher curriculum and lesson planning guides to child care programs to improve the quality of child care. During the month of October as we celebrate the new vehicle and return of this valuable service, child care providers may choose to keep books and other resources for their programs. Childcare Resources is donating useable materials from their collection to child care programs as the agency prepares to stock their shelves with new resources for 2014. For more information on this service, contact the agency at 205-252-1991 ext. 315. Top 10 Reasons to Attend TEMPO this Saturday! 10. Participate in a family bike ride downtown! 9. You can meet members of the Birmingham Barons! 8. Learn about bike skills and safety for riders under 12, presented by BUMP! 7. Get free bike repair and maintenance lessons from BiciCoop and Redemptive Cycles! 6. See The Checkerboard Guy! 5. You might win a bike from Cahaba Cycles! 4. “Funderstanding” activities: children’s games and activities provided by local nonprofits, with updated information for parents! 3. The first 500 children will receive a free bike helmet from Cory, Watson, Crowder & DeGaris! 2. Have you seen how beautiful the weather is going to be Saturday? 1. It’s a great way to spend the day in Railroad Park with the whole family! 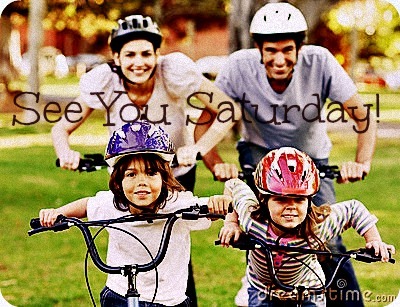 So, grab your bike and helmet, pack up the family and join us at TEMPO!